Visit Goldsmith's Inlet and Cupsogue Beach County Park for some beach relaxation. 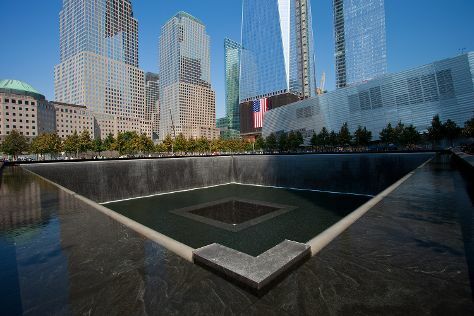 Visit 9/11 Memorial and New York City Hall for their historical value. Get out of town with these interesting New York City side-trips: Point Lookout Beach (in Point Lookout), Ocean Grove Beach (in Ocean Grove) and Ponquogue Beach (in Hampton Bays). Next up on the itinerary: take a stroll through Times Square, go for a walk through The High Line, make a trip to Empire State Building, and admire all the interesting features of Central Park. To find maps, traveler tips, reviews, and tourist information, you can read our New York City online holiday planner . Seattle to New York City is an approximately 9-hour combination of flight and bus. You can also fly; or drive. Due to the time zone difference, you'll lose 3 hours traveling from Seattle to New York City. Traveling from Seattle in July, expect New York City to be somewhat warmer, temps between 86°F and 72°F. Finish up your sightseeing early on the 13th (Sat) so you can catch the train to Philadelphia. Start off your visit on the 14th (Sun): contemplate in the serene atmosphere at Cathedral Basilica of Saints Peter and Paul, then take in the history at Valley Forge National Historical Park, then admire the local landmark of Longwood Gardens, and finally explore the different monuments and memorials at Christ Church. On the 15th (Mon), you'll have a packed day of sightseeing: get engrossed in the history at Eastern State Penitentiary, steep yourself in history at Elfreth's Alley, then get a sense of history and politics at Independence Hall, then get to know the fascinating history of Independence National Historical Park, and finally appreciate the history behind Liberty Bell Center. To find other places to visit, ratings, and more tourist information, you can read our Philadelphia journey maker website . Traveling by train from New York City to Philadelphia takes 2 hours. Alternatively, you can drive; or take a bus. In July, daily temperatures in Philadelphia can reach 88°F, while at night they dip to 72°F. Finish your sightseeing early on the 15th (Mon) to allow enough time to take a train to Baltimore. Kick off your visit on the 16th (Tue): appreciate the extensive heritage of Fell's Point, then admire the architecture and history at Fort McHenry National Monument, then explore and take pictures at Oriole Park at Camden Yards, and finally take a stroll through Inner Harbor. To see where to stay, photos, ratings, and other tourist information, go to the Baltimore trip itinerary maker app . You can take a train from Philadelphia to Baltimore in 1.5 hours. Other options are to drive; or take a bus. In July in Baltimore, expect temperatures between 89°F during the day and 74°F at night. Finish your sightseeing early on the 16th (Tue) to allow enough time to take a train to Washington DC. To see reviews, ratings, and tourist information, you can read our Washington DC trip website . Traveling by train from Baltimore to Washington DC takes an hour. Alternatively, you can drive; or take a bus. In July, daily temperatures in Washington DC can reach 89°F, while at night they dip to 73°F. On the 17th (Wed), you're off toMiami. Relax by the water at South Beach and Haulover Beach Park. Your inner history buff will appreciate Art Deco Historic District and Lincoln Road. Get out of town with these interesting Miami side-trips: Hollywood Beach (in Hollywood) and Fort Lauderdale Beach (in Fort Lauderdale). There's still lots to do: wander the streets of Collins Avenue, admire all the interesting features of Espanola Way, admire the natural beauty at Fairchild Tropical Botanic Garden, and get a taste of the local shopping with Aventura Mall. Ask Inspirock to suggest an itinerary and make planning a trip to Miami fast, fun, and easy. Fly from Washington DC to Miami in 4.5 hours. Alternatively, you can do a combination of train and flight; or drive. In July in Miami, expect temperatures between 91°F during the day and 78°F at night. Wrap up your sightseeing on the 22nd (Mon) early enough to travel back home.